Contemporary Women Artists???? What? Where? Who? Here are 733 of them, recently gathered in Los Angeles. As the title of a recent New York Times piece about the exhibition indicates, there were few women represented: "51 Contemporary Artists, but Just Three Women." According to writer Ken Johnson, "After perusing [the show] at the Philadelphia Museum of Art, a big exhibition featuring works by many famous artists of the last 50 years, including Jasper Johns, Ellsworth Kelly and Gerhardt Richter--a visitor might wonder, 'What about the great female artists?'" Only three works in the show are by women: a sculpture by Louise Bourgeois, a sculpture by Kiki Smith, and a video by Yael Bartana. Having asked such a provocative question--what about great female artists?--Johnson does provide some interesting analysis, based on the interview with art collectors Keith and Katherine Sachs published in the exhibition catalogue. 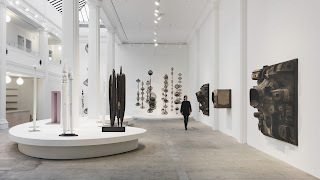 Johnson refers to them as "big-game hunters"--the couple made lists of artists and methodically acquired their work, cultivating relationships with noted galleries and the artists they represent. As Johnson observes, "It’s a finely tuned and self-perpetuating system: Elite collectors, galleries and museums routinely work together to maintain the blue-chip reputations of artists they’ve invested in. The present exhibition is a perfect example of the system at work--a system, not just incidentally, that for whatever reason has been benefiting male more than female artists for a long time." About the interview, he concludes: "nowhere in their interview does the dearth of female artists in their collection come up." And, "considering how hugely active and influential female artists have been in many different genres during the time the couple has been collecting, why does the show focus almost exclusively on white, male artists in its embrace of the contemporary?" Is that really a real question? While Johnson says the question "lingers," I don't see it lingering at all . 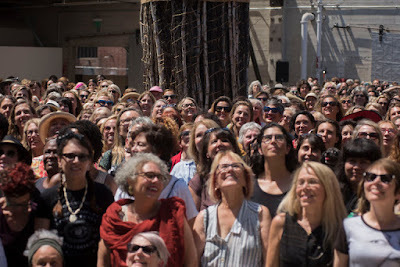 . .
And for an answer to Johnson's "What about the great female artists," I suggest taking a look at the phenomenal group portrait of 733 female artists (above) taken recently in Los Angeles to celebrate "Revolution in the Making: Abstract Sculpture by Women, 1947-2016." Ironically, this show at the Hauser Wirth & Schimmel Gallery (Los Angeles) closed yesterday, 4 September 2016--it featured "nearly 100 works made by 34 artists over the past seventy years." Yes, 34 artists--and that included sculptors only. While the installation has been closed, the gallery links remain live--there is an excellent overview essay as well as a list of works and images. Click here. As for that group portrait of 733 women artists? Read more about it here, and then view a brief slide show. not one piece, but a gallery full!